Contractors, institutions, and do-it-yourselfers alike find Multi-Flow Drainage Systems to be fast, convenient, and affordable to install. NTIT™ (Narrow Trench Installation Technology) methods depart somewhat from traditional methods. Consequently, they require some explanation. But in the end, we’re confident that you will agree that NTIT™ is a giant step forward in drainage practice. Brentwood Industries, Inc.'s StormTank Modules for Stormwater Storage are rugged and lightweight, offering up to the largest void space of any subsurface stormwater storage unit currently on the market. The modules are simple to assemble and install, easy to clean, and their stackable design allows them to manage large volumes of water. The StormTank system has been extensively tested and demonstrates strength that exceeds current industry standards. Aside from being strong and efficient, StormTank also protects the environment and increases developable space. 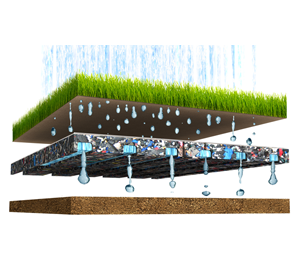 ACO StormBrixx® is a unique and patented plastic geocellular stormwater management system. 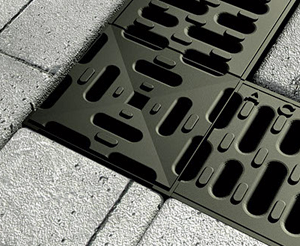 Designed for surface water infiltration and storage, its versatility allows it to be used in applications across all construction environments as a standalone solution or as part of an integrated sustainable urban drainage (SUDS) scheme. 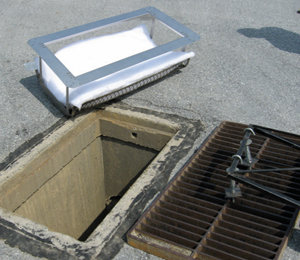 The Inceptor, from Stormdrain Solutions, is a grate or curb inlet suspended catch basin insert that complies with NPDES, 40 CFR 122.26 when used as a Best Management Practice in storm water pollution prevention plans. ABT, Inc. manufactures PolyDrain trench drains; the standard for pre-engineered trench drains. 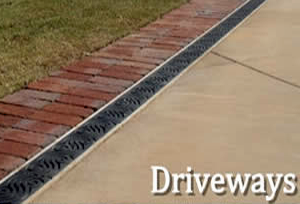 Over the years the PolyDrain name has become synonymous with trench drain design. Architects and engineers, recognizing the benefits of pre- engineered polymer concrete trench drains, specify PolyDrain for a wide variety of applications. 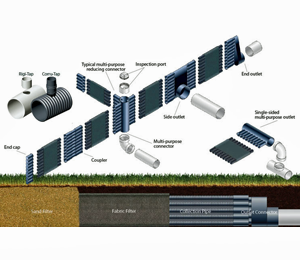 Multi-Flow, by Varicore Technologies, Inc. is a comprehensive soil water management strategy. Many millions of feet of Multi-Flow have been used in projects throughout the United States and internationally. From highway jobs to residential projects, from airport runways to railroad tracks, from golf courses to soccer fields, baseball fields, football fields, and even amusement parks, Multi-Flow has been the drainage system choice for countless wise consumers. The Multi-Flow Drainage System is a fast acting, durable drain intended for the efficient removal of excess soil water. Multi-Flow's rugged design allows for shallow installation resulting in faster water entrance and reduced installation costs. Its extensive surface area collects water quickly and its unobstructed flow channels carry that water away at an astonishing rate. Stormdrain Solutions is a Pennsylvania based corporation that has developed an innovative, cost effective solution to abate stormwater pollution. Our patented design removes a significant percentage of the contaminants from stormwater runoff. The Inceptor is an expanded stainless steel cage which is suspended in an existing stormdrain inlet requiring only a biannual replacement PolyDak filter. The PolyDak filter coalesces contaminants that are transported by means of stormwater runoff from parking lots, highways, streets, loading docks, service bays and construction sites. The release is cleaner surface water, which promotes environmental awareness and compliance with the NPDES Phase II Stormwater Regulations. The Inceptor has revolutionized the stormwater treatment industry. ACO is a worldwide leader in trench drainage solutions and provides products and services to several water management industries. Its commitment to excellence offers customers the confidence that ACO products are rigorously tested and that its customer service will go beyond the expected to provide solutions to any water management challenge. ACO in the United States is a leader in products that address the collection phase and is expanding with products to hold, clean and release water. During the 1970’s, ACO introduced modular, polymer concrete trench drains to the US market. Today, ACO manufactures a range of drainage and landscape products from polymer concrete, stainless steel, mild steel, cast iron, fiberglass, and molded plastics. ABT, Inc. began with a single focus: provide products and services to solve North America's surface drainage problems. With European technology and the superior raw materials to produce high quality polymer concrete available in the Piedmont area of the Carolinas, ABT began operation just north of Charlotte, in Troutman North Carolina, on March 31, 1983. Over the last several decades, ABT has experienced steady sales growth by providing new products and technical services that have not only met, but exceeded customer expectations. ABT, Inc. is a registered IACET CEU provider. Click to view catalogs of each of our major product lines. Brentwood Industries, Inc. provides robust and cost-effective solutions that meet the diverse needs of a wide range of industries. Our engineers take a hands-on approach, working closely with customers throughout the design, engineering, and manufacturing phases of each project to address our customers’ most complex challenges. Brentwoods' StormTank product line, which consists of the StormTank Shield, StormTank Module and StormTank Pack, is engineered to meet the most stringent industry performance standards and provide a flexible solution to varying project demands. 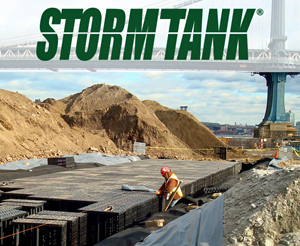 Utilized for infiltration, detention, reuse, and pretreatment purposes, StormTank products offer an affordable and sustainable solution for stormwater management. SportsEdge® manufactures and supplies sports field equipment and drainage systems for outdoor sports construction. SportsEdge® is a division of ABT, Inc. In mid-1995, ABT began marketing SportsEdge® Pro, a product line specifically designed for track and athletic field drainage, followed by the SportsEdge® XT Slot Drain in 2001. Whether it’s a SportsEdge® manufactured product or a product manufactured by one of our partners, SportsEdge® will supply you with a complete line of high quality products for your track or sports field projects, and we’ll do it with the best customer service in the business! Whether you are a sports field designer looking for design help or a sports field builder looking for pricing, you will find both our regional sales managers and inside sales reps quick to respond to your phone calls and emails. We look forward to serving you. (Stormwater Tanks) 7901 Xerxes Ave. So.